Tonight’s opening act Jarlath Regan (whose own twenty-minute set was admirable, culminating in a crowd-pleasing bit concerning health ‘boot-camps’) introduces Marc Maron by noting that everyone in the room owes the man a great deal. The thunderous applause that greet the fifty-one-year-old stand-up appear to support the assertion. Maron is at an interesting point in his career. On one hand both his stand-up and seminal podcast (WTF for the uninitiated) are deeply personal affairs detailing his current struggles, joys, and neuroses with a level of honesty rare even between close friends. Such an approach attracts, in his own words, a disposition as opposed to a demographic: similarly socially anxious misfits and misanthropes of all ages. On WTF Maron often talks of when a confused club owner explained to him that, although the room had sold-out, he’d never seen so many single tickets sold. Clearly this is a performer who has a particularly personal connection with his fans. On the other hand, such a personal approach has recently gained him unprecedented success and popularity after years in the entertainment wilderness. Critical acclaim for his podcast coupled with high profile guests from the worlds of comedy (Louis C.K., Judd Apatow, Mel Brooks), music (Thom Yorke, David Byrne, Nick Cave), TV & film (John Hamm, Lena Dunham, Michael Keaton), and politics (Barack Flippin’ Obama) have made him, at least for comedy fans and those ‘with-it’, a household name. Both on his podcast and in his stand-up, he doesn’t hide the fact that this makes him uncomfortable. The Southbank Centre’s Queen Elizabeth Hall is a room designed for musical performance and a bit of dance, not for stand-up comedy. Instead of the cramped and uncomfortable intimacy that suits stand-up (think of a cellar, dingy room above a pub, or a bog) the seats are well spaced and stretch far from the stage, looking down on the performer. Furthermore, the room’s acoustic design means that both microphone output and audience laughter boom around the room, flitting away into the corners. 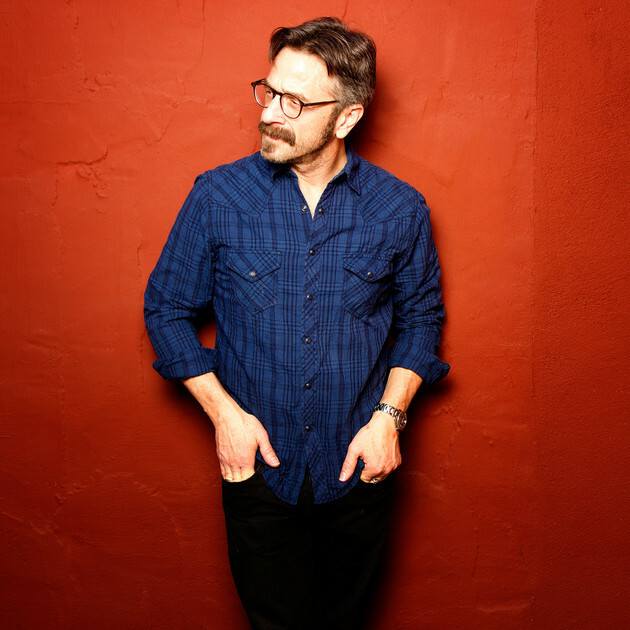 It could be these issues – or perhaps Maron’s often referenced jet-lag – that cause apparent nervousness and unsureness of audience reaction at the beginning of the set. For example, when an early and seemingly unplanned anecdote titled “The History of Irish Poetry” receives a muted response, he turns to the opinion of a snarky imaginary blogger. Apparently the start of the show is “a little stumbly”. This amusing device is employed throughout the show artfully to highlight specific audience reactions and allows Maron to break out of and comment on material. However, it doesn’t take long for Maron to get into his groove. An early high point of said groove is the discussion of a painful realisation: Marc enjoys being angry. The subject is dealt with using trademark bleakness and honesty, and somehow this summons laughter. Indeed, an impressive aspect of Maron’s work is his ability to broach topics in his comedy that most people don’t even voice without the consumption of too much alcohol. Although credit has to be given to joke construction and timing (after all, Maron has been performing for over twenty-five years), I believe that it is the rare honesty concerning taboo feelings that makes such material work. As the curtain closes following two storming bits concerning the unifying capabilities of male sexual fluid and the addictive qualities of ice cream (the struggle is real), the crowd offers a reaction close to a standing ovation. Obviously there wasn’t actually one; Maron’s fan-base would feel too awkward to do so. However, the feeling was present in their response. As the audience filed out they looked relieved in the most part. I’d offer that those single ticket holders had finally found someone to relate to; someone that they certainly owe a great deal to. Letters to Freshers: Ready, Steady, Cook!